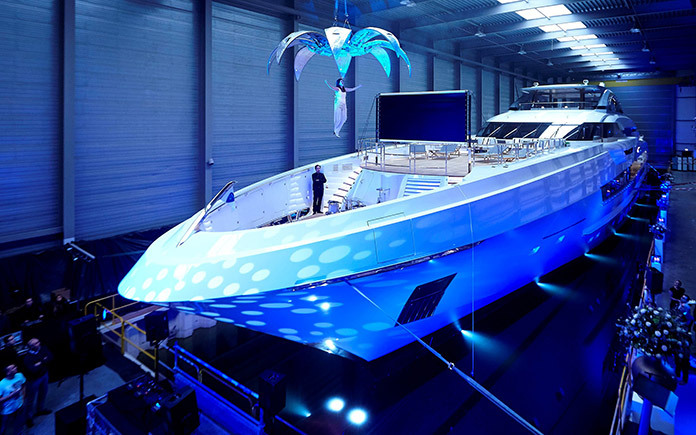 Heesen Yachts announced the launch of the largest yacht in its fleet to date, the 70m FDHF superyacht Project Kometa. 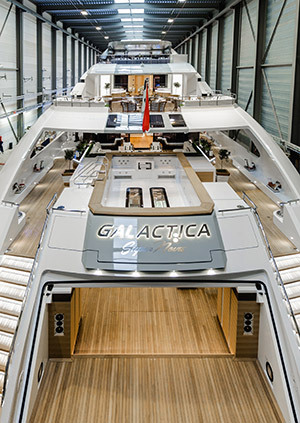 The owners have christened their new yacht Galactica Super Nova. 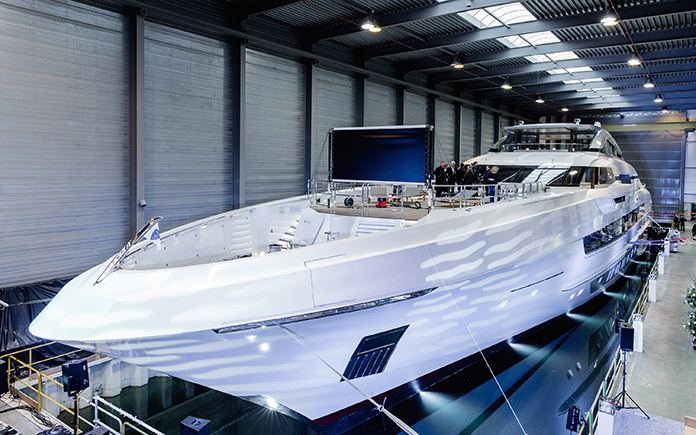 Heesen has been building fast yachts since 1978 and during that time they have become world leader in the field. 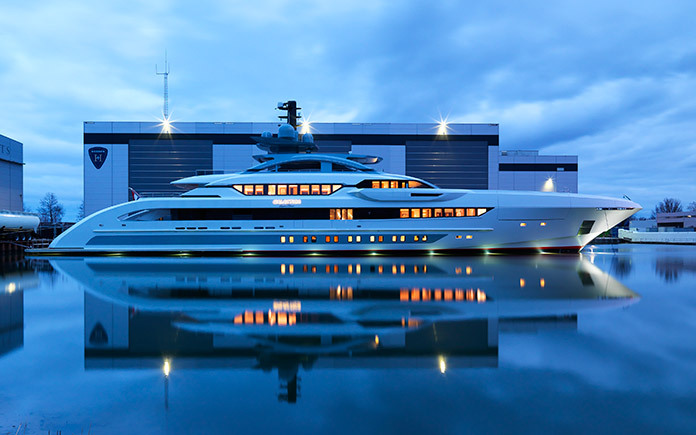 With exterior lines by Espen Øino and interior design by Sinot Exclusive Yacht Design, Galactica Super Nova is both an evolution of Heesen’s long experience in the superyacht sector and also the result of a specific research into what the market wants and expects. Galactica Super Nova is the result of what is perceived as a growing market demand for fast transit speeds, seamlessly combined with the high level of comfort and space traditionally associated with displacement yachts. Beyond her terrific efficiency and high speed, Galactica Super Nova epitomizes luxury on water. Having tender and toys (including a quad ski) housed in the garage located in the forward part of the hull, allowed to develop a fantastic beach club that offers the owners and their guests the possibility to enjoy a lifestyle closer to the water. Other key features include a 13.500 litres pool on the main deck aft with contra flow system for swimming, a waterfall and integrated Jacuzzi for relaxing, while the glass bottom of the pool allows natural light to filter into the beach club below. 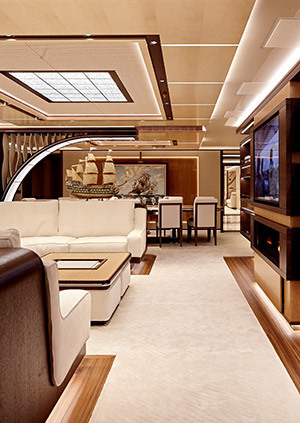 Forward on the main deck, a touch-and-go helipad facilitates guests arrival on board and doubles in an outdoor cinema that perfectly completes the luxurious lifestyle on board this superyacht. 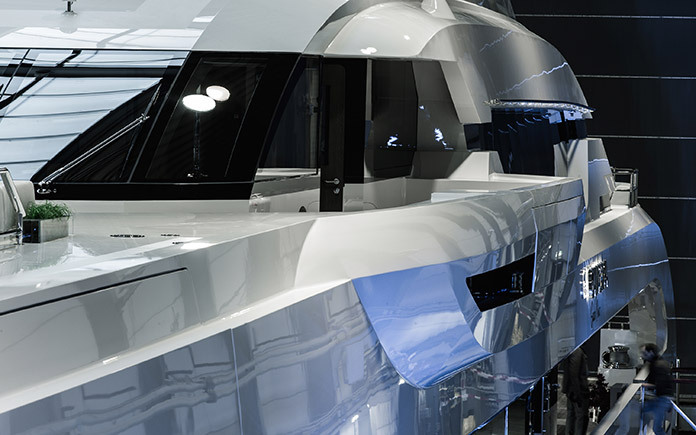 This incredible piece of technological luxury is wrapped in a head-turning exterior design by world renowned designer and naval architect Espen Øino, who worked on a pre-established engineering platform provided by Heesen’s in-house experts. 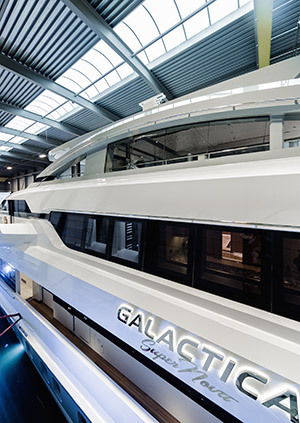 Espen Øino has been able to develop a profile that celebrates Heesen’s DNA but at the same time brings in new design elements that make Galactica Super Nova stand out in Heesen’s galaxy. Twelve guests will be accommodated in six staterooms with the master suite on the main deck forward, four guests cabins on the lower deck and a VIP found on the wheel house deck aft. The owner appointed acclaimed Dutch designer Sinot to create the light, pure and well-balanced interior with a sophisticated equilibrium between monochromic and soft colors. The atmosphere is relaxed and informal, understated and inviting yet extremely refined. A wide range of leathers – from galuchat to very soft calfskin – form the basis of the interior decor that includes a variety of stones such as calacatta luccicoso and various onyx. The stand-out feature in the interior is the central staircase with a crystal elevator. Steel, nickel, chrome, wood and leather flow together to form a magnificent and grandiose architectural helix.